1Rad-Reader Reviews: We are so Excited!!! Guess who is coming on Friday? 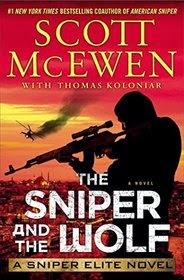 Scott McEwen Author Of "American Sniper & Sniper Elite"
We are so Excited!!! Guess who is coming on Friday? 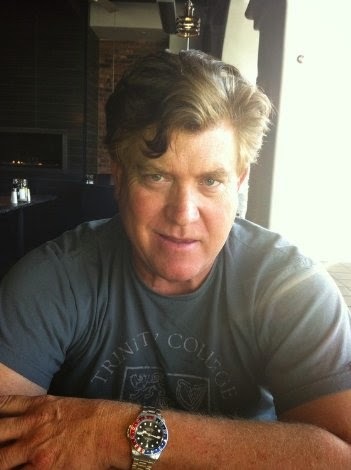 Scott McEwen Author Of "American Sniper & Sniper Elite"
Gripping, eye-opening, and powerful, American Sniper is the astonishing autobiography of SEAL Chief Chris Kyle, who is the record-holding sniper in U.S. military history. Kyle has more than 150 officially confirmed kills (the previous American record was 109), though his remarkable career total has not been made public by the Pentagon. In this New York Times bestselling memoir, Kyle shares the true story of his extraordinary decade-long career, including his multiple combat tours in Iraq (Operation Iraqi Freedom) and elsewhere from 1999-2009. Kyle’s riveting first-person account of how he went from Texas rodeo cowboy to expert marksman and feared assassin offers a fascinating view of modern-day warfare and one of the most in-depth and illuminating looks into the secret world of Special Ops ever written. From the coauthor of Chris Kyle’s #1 New York Times bestseller, American Sniper: In direct defiance of the president’s orders, Navy Master Chief Gil Shannon, one of America’s most lethal SEAL snipers, launches a bold mission comprised of SEAL Team Six and Delta Force fighters to free a captured female helicopter pilot being held by Taliban insurgents in Afghanistan. From the coauthor of the #1 New York Times bestseller American Sniper comes a heart-pounding military thriller in which the fabled domestic Special Ops Black unit is activated in order to stop a group of Chechen terrorists from launching a pair of “suitcase” nukes somewhere in America. When Chechen terrorists manage to smuggle a Cold War era Russian nuke across the Mexican-American border, the President is forced to reactivate the only unit capable of stopping them: Navy SEAL sniper Gil Shannon and his brash team of SEALs and Delta Force fighters. 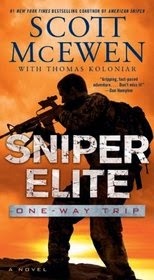 First introduced in Sniper Elite: One Way Trip, hailed by Publishers Weekly as a “meaty thriller” with “snappy dialogue and well-timed humor,” Shannon and his team were run out of the military after defying direct orders and instead choosing to save the life of one of their own. 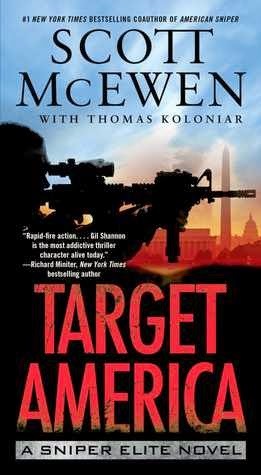 In Target America, Gil and his team, many of whom had gone rogue, are reunited as an off-the-books Special Ops unit that must race against the clock to save the country from nuclear destruction. #1 New York Times bestselling author Scott McEwen once again delivers a gripping and fast-paced adventure that illuminates the shadow world of clandestine military operations.